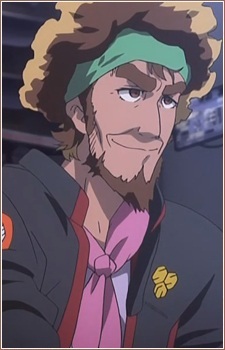 Highly skilled helmsman of the S.M.S mothership, SMS Macross Quarter. Somewhat stern in appearance, he is "just like a girl inside", as he often says. He was a hair stylist, as well as a make-up artist, somewhere in the past. He is well-liked by female crew members for his good understanding of others. He's a gay man and has not-so secret feelings for Ozma. Tends to constantly criticize N.U.N.S. actions on a regular basis. Apparently very feminine, calm and soft-spoken during peace time. He will become quite serious, daring and aggressive during combat.